Ever since its introduction in America almost forty years ago, the Volkswagen Beetle has been improved upon and updated feature by feature. Sometimes a small addition like a fuel gauge or four extra horsepower. Other times more significant changes such as a 12 volt electrical system or McPherson Struts up front. 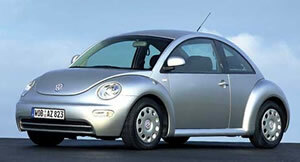 In its latest rendition it has evolved tremendously from the Super Beetle that we remember from the seventies. Again, some of the changes are apparent..... Front wheel drive, Liquid cooling, A real heater that works! Others are more discreet. To the casual observer, the locking system would appear to be the latter. As an automotive lock specialist, I would have to disagree. A quick look at the key and you notice that there is something a little different, but that is only the beginning. A closer look at the business end of the key reveals what resembles the cross section of a worm hole in an apple rather than the teeth of a traditional automobile key.
. The description comes in part from the appearance of the smooth flowing pathway carved into the side of the keyblank. More accurately, it is what we call an internal two track key and it is manufactured using a vertical milling machine, not a laser. The important thing to understand is that this is a state of the art high security locking system usually found on vehicles with at least twice the sticker price of the new Beetle. One of the ways we make sure we are ready to provide service for a new vehicle is by getting our hands on one and disassembling then reassembling all the locks. We want to find any surprises on our time, not yours. I recently had the opportunity to be intimate with the locks on the new Beetle and I must say it was a pleasure. In these times of cost cutting and weight reduction in the pursuit of ever higher corporate fuel economy averages, we have seen some lock designs using what we consider less than ideal materials. Such is not the case here! These locks are the real deal. Well thought out details like a spring loaded intermediate sleeve to foil the ever popular screwdriver attack, and a solid cast housing on the door locks. One door lock from this car weighs as much as a complete set of locks found on many vehicles in the same price range. This is good news for the owners of the new Beetles and will no doubt help insure that the vehicle will remain where the owner parks it. We look forward to seeing more auto manufacturers follow Volkswagen's lead in this area. Volkswagen has made this lock system standard on the 1998 - 1999 Beetle and Passat, and on the 2000 - 2001 Beetle, Golf, Jetta, and Passat. As always, you can be assured that Old Capitol Lock Services has the information, materials, and expertise to service the locks on your new Beetle or other vehicle. systems. The keys are not only high security side milled, but need to be electronically matched to the vehicle. We are able to provide this service for you.